Analysts predicted June would turn out weak gaming sales compared to last year. They got what they predicted and then some. According to NPD data released Thursday, the sector returned its fourth consecutive month of year over year sales declines with total revenue dropping 31% to $1.17b. The reversal of fortune has provoked some to proclaim the recession has finally caught up with the industry so often deemed “recession resistant.” Other’s are taking a more measured view. The truth probably lies somewhere in between: the industry results reflect the combination of slowing purchases (the economy) and also, a comparatively weaker product slate. Product shortcomings are particularly evident in the software segment where recurrent top ten hits (e.g. Nintendo’s “ever-green” titles) are getting stale, and new releases haven’t yet matched the same high bar. A similar phenomenon was apparent last month in May’s result. A comparative look at the numbers does seem to support Frazier’s remarks. The data, paints a picture that’s more tempered than steep revenue declines indicate on first glance but it also indicates areas of concern. In June of 2008, Sony’s PS3 chalked up a mighty tally of 405k units sold. The volume of sales, otherwise far outside of the console’s trend lines, was a direct result of high demand for Konami’s Metal Gear 4 (774.6k units) title. With the game spurring sales, the PS3 nearly doubled its May output (208k units). It was huge. This year, in June 2009, lacking a title with even a fraction of the same drawing power, the PS3’s sales receded to 164.7k units. That was good enough to be a sequential improvement over April and May (see links below), and it was up over 2007 sales too but compared to the blockbuster-induced result in 2008, it was nearly 260K units light. Added up at $399 a unit, the difference in sales for the PS3 would account to close to half of the gap between 2008 and 2009’s hardware sales. (It’s nearly a $95m difference). If you add in the influence of price cuts on the Xbox 360, which result in less revenue per unit sale (unit sales for the 360 were actually up over last June), a significant amount of the year over year difference in hardware sales can be explained away as the result of singular events. Assuming adjustment for the PS3’s anomalous performance in ’08 and the Microsoft price cuts, the only area of substantial hardware weakness (relatively speaking) in June, surprisingly, was Nintendo’s Wii. For the second month in a row, the console that’s otherwise dominated its peers seemed almost in reach of the competition. For June, Nintendo sold 361.7k Wii’s. That was good enough for second place behind the company’s DS/DSi in the rankings but it was a far cry from last year’s 666k units. Is the Wii’s performance a sign demand for the console is slowing? It may be. The Wii’s sales remain strong, both compared to prior generations of consoles, and its peers, but the growth rate could be slowing. It’s something to watch closely in July and August numbers. 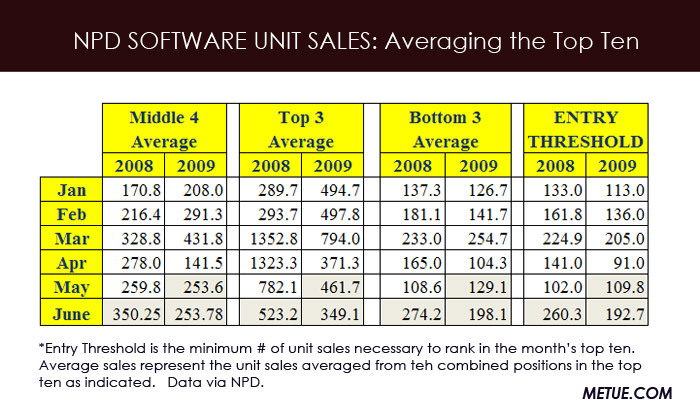 For June, software sales were off 29% year over year to $625.79m. Like hardware, the results didn’t match up well to last year. To mitigate the impact of one or two blockbusters and try and get a sense of the entire top ten’s relative strength, we used a few familiar Metue methods. First we looked at the “Entry Threshold” (the minimum number of units sold to rank in the top ten), and second, we lumped the software titles from the list into three groups: the top three sellers, the middle four and the bottom three. Looking at the Entry Threshold, the industry showed some relative strength sequentially, jumping well ahead of May. The result also held up reasonably well compared to 2008’s stellar yield. The combined sequential and comparative view suggests demand is still solid for titles but being spread around a broader pool. That is further supported by the grouped analysis. Sequentially, compared to May, the laggards in the top ten (bottom three positions) sold far better in June while the Middle Tier stayed near flat. Year over year, there was no comparison. If there was any clear highlight in June, it was third party publishers hitting their stride. Activision’s “Prototype” topped the top ten list while THQ’s UFC title remained strong with a second place finish (Xbox 360 – its PS3 version finished 12th). THQ also broke into the top ten with Red Faction. EA snagged four slots (third, four, sixth, and seventh) with three sports games. The distribution among platforms was four for the Xbox 360, four for the Wii and two for the PS3. The software surprise of the month was a weaker than usual result for some of Nintendo’s evergreen titles. After sliding from fourth to tenth in May, Nintendo’s monthly favorite Wii Play dropped out of the top ten to come in at 16th. Pokemon Platinum DS, which went from two to eight in May rankings, slipped to fourteenth. Mario Kart DS also slipped, landing at 18th. Mario Kart for the Wii and Wii fit both remained in the top ten. Looking at cross-platform sales (see updated graphic), the Xbox 360 continued to beat up the PS3, when matching results for titles offered simultaneously on both platforms. For June, Activision’s Prototype was number one overall with 419.9k units sold. The PS3 version came in 13th with 179.2k units. 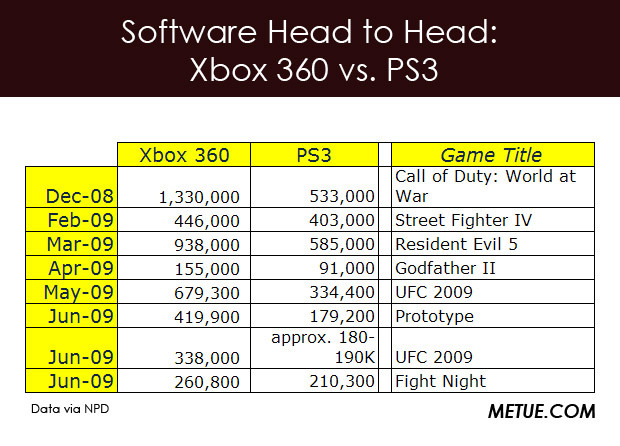 Similar was true with the month’s dueling fighter titles: THQ’s “UFC 2009” and EA’s “Fight Night.” For the Xbox 360, UFC 2009 finished second with 338.3k units to the PS3’s 12th place result. Fight Night for the Xbox 360 sold 260.8K units. Fight Night for the PS3 sold 210.3K.